This coming Friday, the Apple iPhone XR will be launched. According to Robert Cihra, who toils as an analyst for Guggenheim Securities, the release of the most affordable 2018 iPhone will have a negative effect on one of the most important metrics watched by analysts who follow Apple. That is the average selling price (ASP) of the iPhone. Last year, Apple rode the high priced iPhone X to an ASP well above $700 from 2016's $651. But Cihra says that this ASP growth won't happen again for fiscal 2019 because of the $749 starting price of the iPhone XR. In analyst-speak, the device is what they call "ASP dilutive." The low price of the phone combined with just the right mix of features is expected to take sales away from the higher priced iPhone XS and iPhone XS Max. But Cihra adds that the iPhone XR just might attract business from those looking to upgrade from their older iPhone 6, iPhone 6s and iPhone 7 models. He sees the LCD-screened device outpacing last year's iPhone 8 sales by 50%. 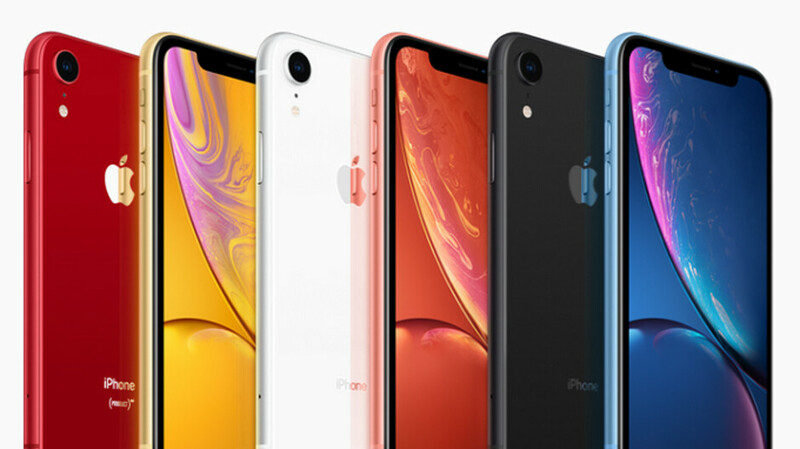 In fact, the analyst expects that in the current quarter, the iPhone XR will make up 40% of iPhone sales, rising to 50% for the fiscal second quarter ending in March. He says that the most expensive unit, the iPhone XS Max, will continue to outsell the iPhone XS by a 3-1 margin. The analyst is looking for Apple to report sales of 47 million handsets for its fiscal fourth quarter, which ended at the end of last month. That would be a 1% gain year-over-year. For the holiday quarter, he expects Apple to ring up 80 million iPhones for a 3% gain over last year's fiscal Q1. ASP should be up 24% year-over-year for the September quarter, dropping back to 6% for the current quarter. He also says that the Apple Watch, paced by the new Series 4, will be part of Apple's fastest growing "Other Products" category with 38% growth in fiscal 2018 and a further 24% in fiscal 2019. As for the Apple iPad, Cihra expects that for Apple's fiscal fourth quarter that ended in September, year-over-year shipments rose 1%. Services revenue is estimated to have risen 14% to $9.7 billion during the same three month period. Just like usual. One article states that they aren't selling well and then another says the opposite. You should read yesterday's article in full. You'd see that there are two possibilities and that analysts still expect it to be the best-selling device, as stated in this one. I predict it will not sell well. The Note 9 offers WAY more at a much smaller price tag given the sales and promotions so anyone with common sense will buy the Note 9. When the revolutionary S10 comes out, it is over for Apple Xs Xr. Not everyone wants a Samsung, though. I know loads of people who would buy the XR over the Note 9 because it's they just prefer iPhones. I know loads of people who would buy the XR over the Note 9 because it's the only option you have for a new lower cost iOS device. Apple has a monopoly on that you know. If Apple doesn't sell allot something's wrong. Well some guys just don't understand that. I have a Note 9, i dont expect many to buy it. And I dont care if they do or dont. I bought what I like like we all do. The just dont make up carp to argue over small detail when much bigger things makes one better than the other. That was not only a stupid post, it’s also incorrect. Its just false period. That's something you shouldn't even make a mistake on. But what if it turns out to be true? After all one of the last iPhones production was cut just 30 days after its release. And they sold less phones at 216M vs 220M the previous year. They are suppose to sell it. So let them. Who cares how many they sell. I hope they sell every last one they make. As I would for anyone else. As long as their is no direct competitor with iOS, Apple is gonna win obviously with it's own product. This is why Samsung is better. Because even with stiff competition. With several Android manufacturers, Samsung still sells more phones than Apple. Yes Apple makes more money, but Sammy actually uses their money to make better products. Apple just makes what they can get away with at the lowest possible cost and the highest profit. Apple has one quality phone. Samsung has more of them. Even some that cost only $100. Of people think the iPhone XR is worth $750, let them buy. If you dont, you dont have to buy it and you dont have to care if someone else does or not. 99% of android can’t justify spending $1000 on a phone. Only apple has the 75% consumers who can spend regardless of price. This year is already over for Samsung. Chinese iphobe knockoffs will gonna destroy them in mid and low range phones. These same Android you speak of that are gonna give Samsung trouble, are also gonna give Apple trouble. After all, why you think the iPhone is doing so poorly in China? It's because of price. Apple barely has 1% market in China. Know why? Because 99% of the people can't afford them. So what will they buy? A legal local brand that looks similar and cost half as much. Yes Samsung is gonna hurt too. Probably more so because they run Android. But here is one thing you stupid fan boys always forget. Samsung can't actually compete on price and Apple cannot. So Samsung could simply join the game of offering better phones for similar price and they have. That's what the J is for. What does Apple have to compete on price? Nothing. Don't you know by now that Apple doesn't care about selling to the customers that can't afford iPhones? What you dont understand is, the only key country that has a credit system is Europe. Asian countries dont have a system of credit. They have to pay cash for nearly everything. Without credit their is a very small post pay system. If you check most Asian carriers, you have to put down a hefty fee to get a phone on post pay. In fact you pay for as much as 75% of the cost in some places. When you consider than the iPhone cost nearly double what it costs in the US, it simply takes the iPhone out of reach. In most Asian countries Apple sells less than 2M phones in a year. It's only in Europe and US where they have huge sales. Which is why Apple must make as much as they can on profit. This is what you fans will never understand about why marketshare is so important. It is a protection When the sells landscape changes, the companies in the bottom get effected first. Even though both Apple and Samsung lost growth in China, Apple is at the bottom. Samsung is not. When you have more share, it takes a bit longer for change to effect you. So you have time to react. Apple can do nothing about China ever. Samsung still has a chance. Apple can't compete in the mid to low range pricing. Please wake up fan. Apple is not immortal. In fact they are more mortal than Samsung. Because Samsing can totally drop out the phone business and still survive. APPLE CANNOT. PERIOD!!!! "It's only in Europe and US where they have huge sales." You forgot China, Apple is getting huge sales from China too Samsung is irrelevant in China, they have 1% share and won't get back their share. First of all, Europe is a continent and it has a lot of countries. Second, iPhones sell very well everywhere there are people with money (even in South Korea, the country of your beloved Samsung, iPhone is one of the best selling smartphone). Samsung, carriers, and retailers have been giving huge discounts on the Note 9 since its release. It’s not selling AT ALL. Latest numbers suggest under 10mil worldwide which is horrific. Samsung is flopping. The people who like iPhones buy iPhones. The problem with Note 9 is that it’s not an iPhone. That just might happen. These Chinese oems and Samsung are running Apple in the ground with sales outside NA and Europe. Huawei doesn't need the US to beat Apple. All they have to do is target the people Apple cant. The same way Apple lost against Microsoft is why Apple will never beat Android. Because Windows and Android went for the majority market that Apple refused to market too. And that is why Apple has less than 10% of the PC market and their profits in the PC market are far lower than Dell and HP. The iPhone is a powerful seller. But it can't sell well everywhere. Poor people now have access to better tech at lower cost. Apple may not go bankrupt, but they will need a selling alternative to iPhone within the next 5 years. Maybe sales, but not profits. Apple makes more profit than all android OEMs combined. The people that Apple isn’t targeting, that Chinese OEMs are, have extremely slim margins because it’s a cutthroat market. So no, it’s not going to happen. Apple doesn't need to beat android, android is operating system. Apple already beat every company where it matters and keep doing that easily next 5 years. I don' see any signs how that would change. We keep getting phones that are less useful at a higher cost. The XR is a better price but is the most bare-bones phone that Apple has ever offered. No headphone jack, LCD screen, no 3d touch. The 6s, 6, and 5s offered much more at a better, though still unreasonable, price. I'm not all iPhone user, but since Android manufacturers seems to chase Apple over every cliff, I shudder to think what this means for Android in the near future. That doesn't even make any sense. It has the same processor in it as the XS and XS Max. Better processor running a low resolution. Lol Such a waste of all the power the A12 has. We know for sure the XR should perform well, because for one it not even push 50% the pixels of its siblings. All that power to just take pretty pictures. So glad I have something else. Apple can do better for what they charge and they dont. Such a waste to have FHD for a small screen. Look at Note 9, its not even their default and no one would think it has. Not being aware you can change the resolution is not the same as not doing it because you dont want roo. It saves kn battery. I keep mine at QHD and my phone still last 2 days on a single charge. In fact the only time a charge doesn't last 2 days is the weekend, because I use it more. The iPhone can't even last 5 hours with usage. The A12 is a power hungry chip where the power is being wasted on kiddish features. I can put my phone in 720p OS I wanted to. Can you? If I put my Note on 720p, it will last almost 3 days based on my ussge. I am totally aware most people sont care about screen resolution. The reason we bring it up that you are too clueless to understand is, for the price you are paying you should have it. The S7 had QHD and it was the same price. I dont understand how you guys are so old with paying more and getting less. Let me ask you smart person. Would you pay Lamborghini prices for a Camry? If not, then why do you do it for a phone.